If the thing you look least forward to on vacation is wracking up vicious amounts of debt on your Master Card, then you've come to the right place. I'm here to offer advice on free things to do while visiting San Francisco. Granted, it is not wise to think that you can go on vacation without spending any money and have a good time. However, it is quite possible to be very selective when deciding where to spend your money by having alternative entertainment options that cost little or no money. 1) San Francisco Botanical Gardens. The climate of San Francisco provides a unique atmosphere that allows the growth and maintenance of plants from around the world. 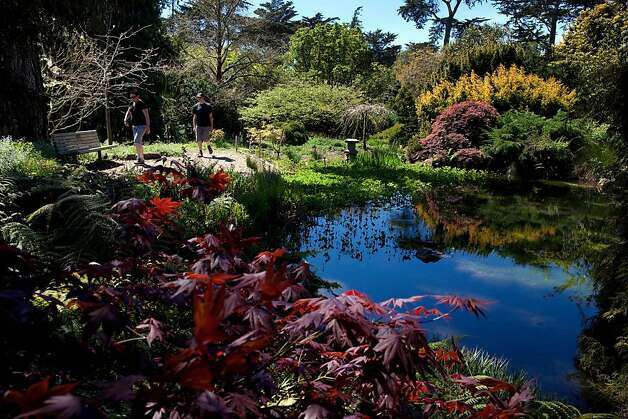 As a result the San Francisco Botanical Gardens offers a look at plants that are rare almost anywhere else on earth. The Gardens are 55 acres and host more than 7500 plants from around the world. 2) Chinese Culture Center. This center offers resources about the Chinese culture in San Francisco in addition to many programs that are available to learn about the artistic and cultural contributions that the Chinese community has made to this great city. 3) Fort Point National Historic Site. This site has special historical significance. Its original intent was to prevent invading forces from entering San Francisco Bay. By the end of the Civil War the massive cannons that had been used for this purpose were obsolete. The last of the original 126 cannons was removed around 1900. During the 1930's, the fort was used as a headquarters for the building of the Golden Gate Bridge. This Fort has played a vital role in our history and is worth a visit, especially considering the fact that it is free. 4) Stern Grove Concerts. These concerts only take place on Sunday afternoons during summer months but are well worth checking out if you have a sunny Sunday afternoon available during your stay. The goal of these concerts is to educate the masses and potentially inspire future musicians. A love of music is the second best gift you can give a child, second only to a love of reading. It's a great way to spend an afternoon, and it's free! 5) Wells Fargo History Museum. This museum is a fun side trip for the family. Not only does it tell the history of Wells Fargo as it pertains to San Francisco, but it also tells of Black Bart and other stagecoach robbers while providing visitors with the awe inspiring story of the great earthquake of 1906 and the role of Wells Fargo in the recovery process. I believe that young and old alike will find this museum to be a lot of fun, especially for the price. If you are visiting San Francisco and need some great family friendly activities to fill your days, then this is definitely a great place to start. I hope that you can find a few more things than I have mentioned here to help fill in gaps and entertain the young and old on your vacation alike. Remember not to over plan your trip, as some of the greatest times to be had are spontaneous rather than planned.